We explored the bustling street stalls, looked into the historical shophouses and read the street signs relating the chequered past of the tangled streets, now a conservation area. After that, the idea of a local lunch, and more particularly a couple of Tiger beers, was irresistible. Hence Fatty Weng’s. We stumbled on it by chance but it turned out to be one of the better-known eating establishments in a place not exactly short of them. It is not particularly glamorous to look at and for the most part rates nothing more than so-so reviews, but it worked for us. Helpings of lemon chicken, stir-fried sliced fish with ginger and garlic, broccoli with garlic, steamed rice, and nuts with the beer saw us replete for the rest of the afternoon. It cost 70 Singapore dollars, or about £40 (they even charge for the napkins), not the cheapest of places where we ate but nowhere near the most expensive either. The range of restaurants and the accompanying long list of hotels of all shapes, sizes and standards in a comparatively tiny destination is as good an illustration as any of Singapore’s status as a place to do business and to enjoy life when work is done. The Central Business District next to Marina Bay and City Hall is renowned for infrastructure as cutting-edge as the dominant skyscrapers. This in turn has attracted the likes of 1-Altitude, billed as one of the world’s highest rooftop bars, and the Kyo nightclub. If you’re into beer, the world’s highest urban craft brewery, LeVel33, is also here, in the Marina Bay Financial Centre Tower. Marina Bay itself is a favourite gathering place thanks to its waterfront promenade linking a series of luxury hotels, nightlife, more restaurants and theatres. Main attractions include the Marina Bay Sands complex with the giant Singapore Flyer observation wheel and the mushroom-themed towers of the Gardens by the Bay park as backdrops. More waterfront enjoyment is to be had along the Singapore River, a 3km ribbon that flows from the Kim Seng Bridge into the Marina Channel and out into the Singapore Strait, linking Clarke Quay, Boat Quay and Robertson Quay, the latter a favourite spot for the burgeoning expat community. Like its neighbours, Robertson Quay has a mix of new-build cafés, bistros and restaurants, while many of those at Clarke Quay have the added attraction of being housed in restored warehouses. Among the other must-sees if you’re a Lion City first-timer, or even a returning visitor in need of some get-away-from-it-all, is the Singapore Botanic Gardens, a Unesco World Heritage Site. It incorporates a number of historical landmarks including Swan Lake, complete with a modern sculpture on the theme, the Gazebo and the Raffles Building, as well as housing the wildly-decorative National Orchid Garden. And talking of Raffles, as in John Stamford Raffles, the founder of British Singapore, no visit to the island state is complete without indulging in a Singapore Sling at the hotel that bears his name. The preferred location for this would be the Long Bar, where the gin-based cocktail is said to have been invented, but the Courtyard is an equally attractive place to sit and enjoy one. The current cost is around 30 Singapore dollars, or about £17, depending on the exchange rate you managed to negotiate before you left home, which everybody except possibly the hotel agrees is outrageous, but it’s one of those bucket-list things. Unless you don’t drink, of course, in which case just enjoy the architecture of this impressive grande-dame of an old-world hotel and the shops fringing the gardens. Two more stops on your tour should be the shopping paradise known as Orchard Road, reminiscent of Fifth Avenue in New York, and the once-notorious Bugis Street, now home to Singapore’s largest flea market and an even-bigger collection of street-food stalls. Eating there in the crowded shed-like buildings is a great way to meet the locals and if you're not sure what's on your plate, there's always someone happy to tell you, sometimes with a twinkle in the eye. As for getting around, pretty much anywhere you want to go is accessible via possibly the world’s cleanest and most efficient subway, the Mass Rapid Transit (MRT), while taxis are plentiful and cheap. Passengers to and from Changi Airport, however, cannot get a direct downtown service. You have to change at Tanah Merah, just a few minutes’ ride from the terminals, another struggle for those with luggage. At the cruise terminal, the situation is far worse, involving a 10min half-mile walk. The name Changi was once synonymous with the infamous POW camp near what today is one of the largest airfield complexes in South East Asia. Past ill-fame is now largely forgotten, with the airport perhaps the most award-winning anywhere in the world, garnering at least 500 titles since 1981. With 55m passengers passing through in 2015, it is the seventh busiest in the world for international traffic, just below Kennedy New York. Getting on for 200,000 people pass through the airport every day, not including staff. With competition intense as a hub, and not just from traditional near-neighbours such as Kuala Lumpur, Bangkok and Hong Kong but also the airports of the Gulf region Changi is looking to the future with the planned 2107 opening of T4. This new building occupies the former Budget Terminal site but the two-storey structure is seven times larger at 195,000sq m. There will be 17 aircraft stands available for narrow-body aircraft, four stands for wide-bodies. Moving in will be Air Asia, Cathay Pacific, Korean Air and Vietnam Air. While great emphasis has been placed on high technology within the new terminal space, it will be connected to T2 by a conventional airport shuttle bus rather than the automated Changi Airport Skytrain that links the other terminals. Already visible is a 68m-high ramp control tower. 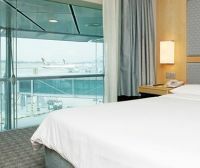 Changi has made much noise regarding facilities for transfer/connecting passengers which account for large percentage of its business. And quite rightly too. One is spoilt for choice and it would be possible to spend a week at the airport, be fed very well, perhaps spend a lot of money, and keep fit and healthy. Aerotel Transit Hotel, Terminal 1, offers quality accommodation, an outdoor pool, fitness and smoking area for those who must indulge. 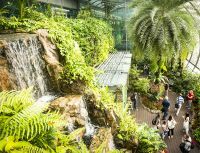 However, pride of place goes to the world’s first airport butterfly garden, featuring state-of-the-art landscaping and a 6m grotto waterfall. Cactus, orchids and sunflowers are featured in other gardens, but outside. When it comes to shops, there are 350 to choose from and by 2019 the new Jewel complex in T1 will be complete, covering 134,000sq m and besides the plethora of commercial outlets will include Forest Valley, a huge five-storey garden filled with thousands of trees and plants. 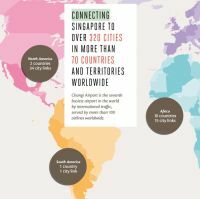 Business Traveller magazine has awarded Changi its “Airport of the Year” prize on 18 consecutive occasions. There is every indication that this will continue. Changi Airport is not only beautiful but the service and accessibility is the best in the world.